The Landry Room is getting a makeover! Woot!! It was pretty much a domino effect with this room, so I’m going to try to just catch you up to speed as quick as possible. 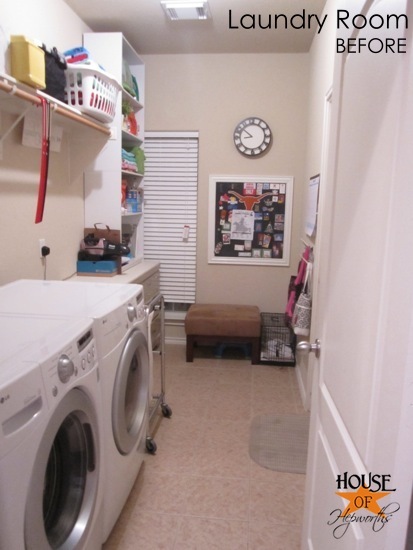 This is my laundry room. 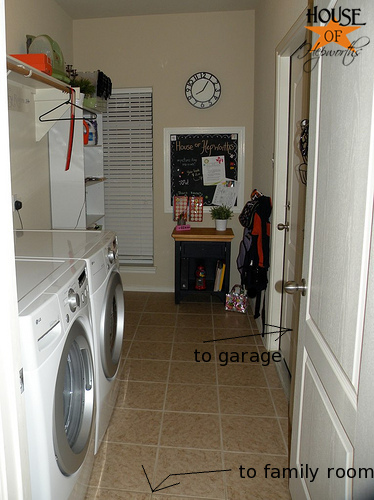 Well, actually that’s a really old picture of my laundry room from this post. This room is pretty much the bane of my existence, but I’ll get more into that in a follow up post. I’ve finally started to renovate this room, and I am so excited about it! Step one of the renovation was to get rid of that ill placed coat rack and shelf. I have hated this shelf from the day we moved in! It’s too high for me to reach, I can’t use it for my laundry soap storage, AND it’s THE ONLY COAT CLOSET in our house. Yes. This is the only place in the house to hang coats. So pretty much we have coats and clothes drying hanging from this rod cluttering up my laundry space. Drives me totally bonkers! To redo the Laundry Room this shelf had to go. 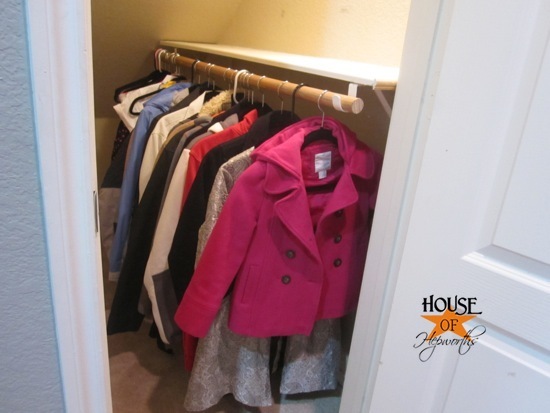 But I was seriously conflicted about giving up my only coat rack in the house. 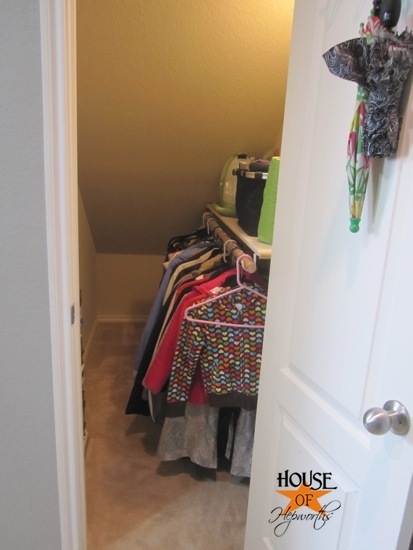 What if this closet under the stairs (next door to the laundry room) could keep all our coats? The closet is deep and sloped and pretty much ads no value to our home at all. It’s been a huge catch-all for all sorts of random crap. I cleared out all the crap from the closet, and then started to measure. 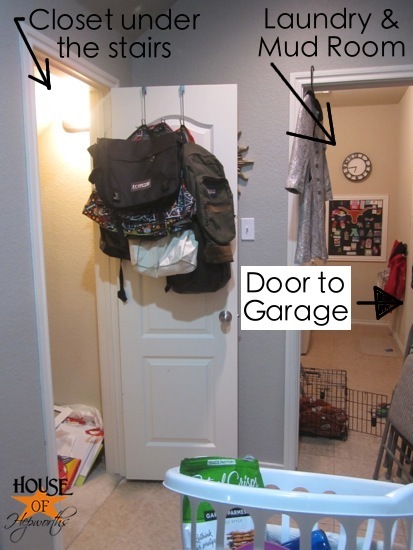 At first I was planning on doing the “normal” thing and hanging a rod across the closet, leaving storage in the back. But then a curious thought hit me. 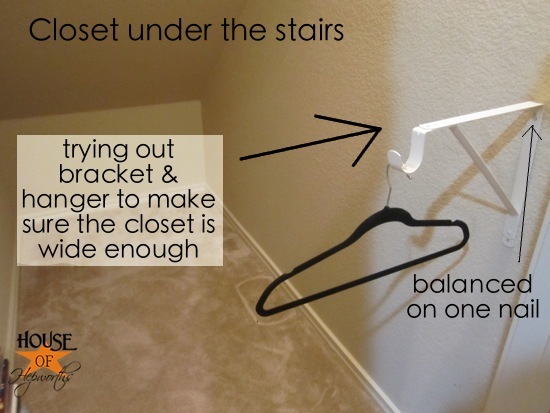 What if I hang the coat rack and shelf in an unconventional way, down the right side of the closet? I grabbed an extra rod bracket I had in the garage just to get a ball-park idea if this would even work. It seems like it will work. I mean, it’s a useless closet. How much of a walkway does one need to get to the back of this closet anyway? Hanging the rod down the side of the closet would certainly give us additional hanging space (more than twice as much actually!) and would still allow for a few additional random items to be stored. So the plan was hatched. 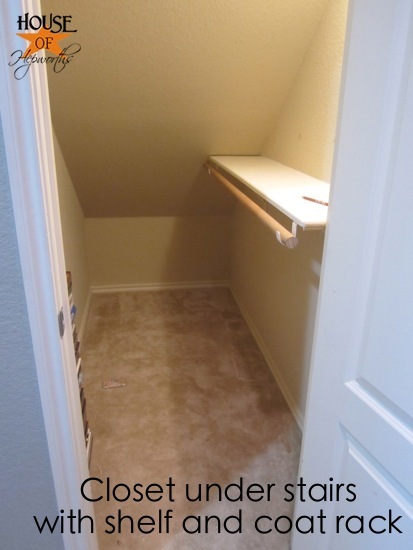 I was going to remove the shelf in the laundry room to make way for my laundry renovation, and I would simultaneously rehang the shelf in this little closet under the stairs. In my mind I had just come up with the best. idea. ever. 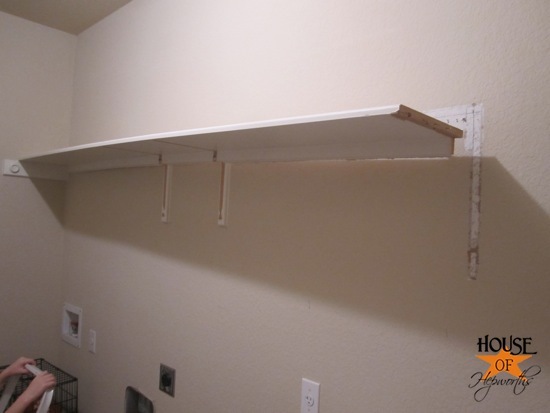 To remove the shelf, I first cut all the caulking around the entire shelf. 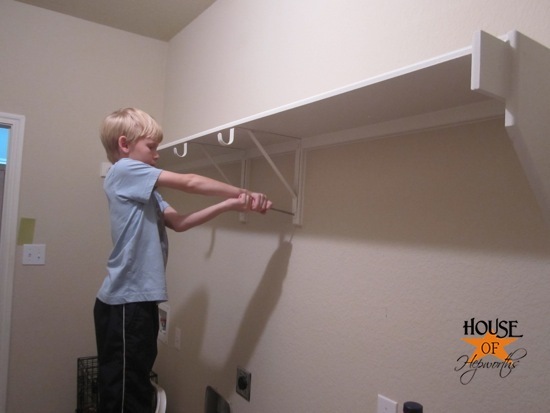 Then I had my handy dandy helper T unscrew all the rod hangers. Okay, okay, he begged. He loves helping with projects! 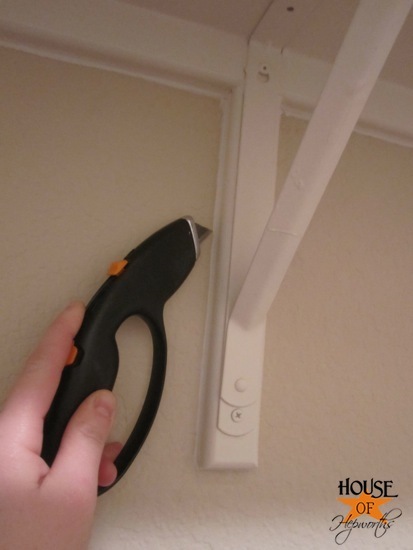 From there I slowly started prying the shelf away from the wall using a pry-bar. I tried to be careful to not break or damage the shelf. 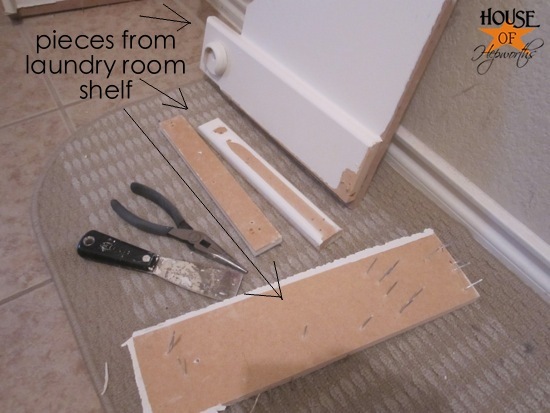 I carefully removed each piece from the wall, then used needle-nose pliers to pull out all the nails. The wall had a little damage from the shelf, so I sanded it down with a sanding block. 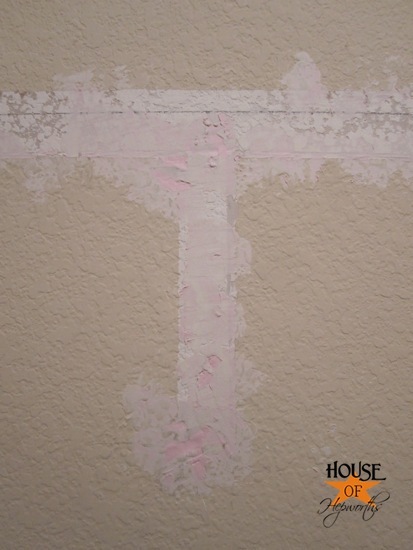 Then it got a coat of spackle. And once it was dry it got another light sanding job. 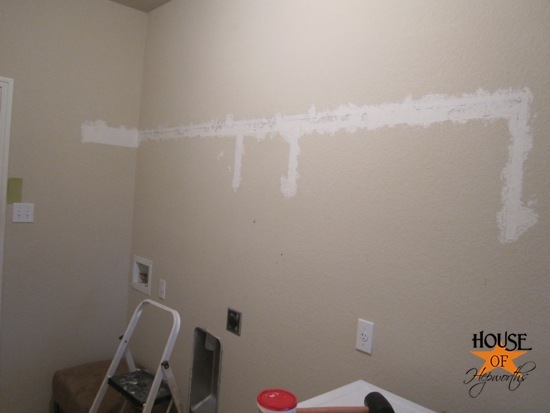 I will finish tackling this wall when I continue on with the laundry room renovation in a future post. The shelf ended up being about 2 feet too long, so I used my Dremel to cut it down. From there I installed it the exact same way it was installed in the laundry room (minus the wooden sides). I reused all the same pieces of wood too. Unlike the shelves I installed in my office closet, I didn’t have brackets on either side to hold the shelf. I had to make sure I attached each of the rod brackets directly into a stud. 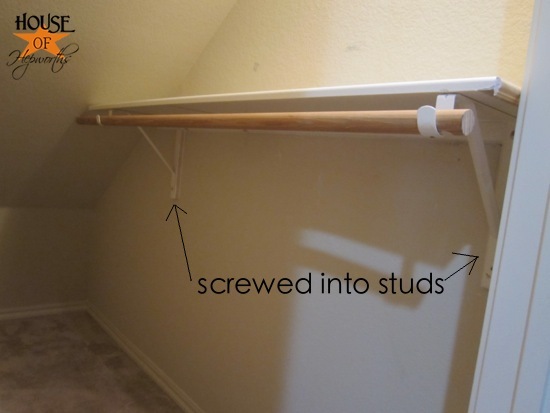 In a nutshell, I attached the brackets and their MDF backing directly into a stud in the closet using nails and screws. Then I set the shelf on top, and screwed the rod bracket to the shelf from the bottom side. 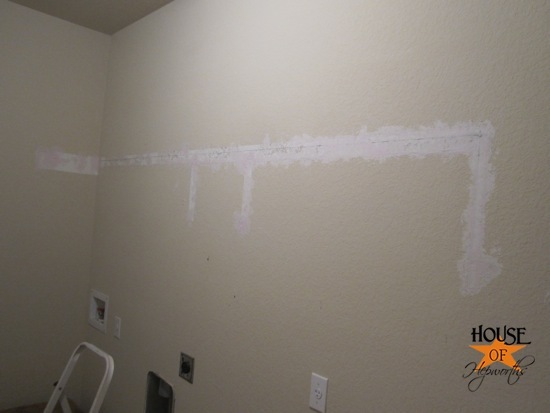 Finally, I caulked everything so it looked better. I did add a small strip of moulding across the side of the shelf, so when you look in the closet the edge looks finished. Eventually I’ll repaint everything. And that is seriously it. After a grand total of only 2 hours, I had removed a shelf and reinstalled it in my closet under the stairs. I eagerly loaded it up with coats and was so excited to see that everything fit and I still had plenty of room to walk into the closet. A few days later, once everything was settled back into place, I took a few more pictures. The shelf on top is perfect for storing my Little Green Steam Machine (best carpet cleaner ever! ), a picnic basket full of our winter gear (we don’t own much as we live in Texas), and a picnic blanket. And since this project was completed last week, I’ve even hunted down another 4 umbrellas, so they are all hanging on the door now. 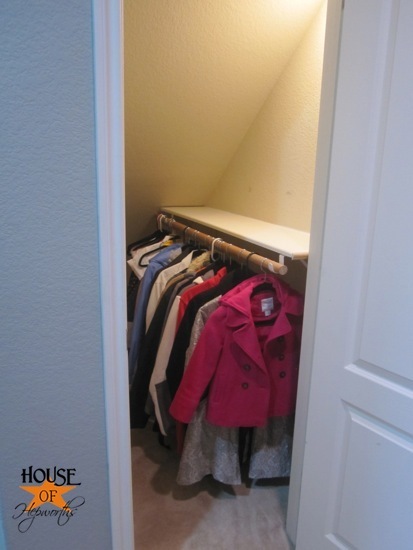 I absolutely LOVE this new coat closet. 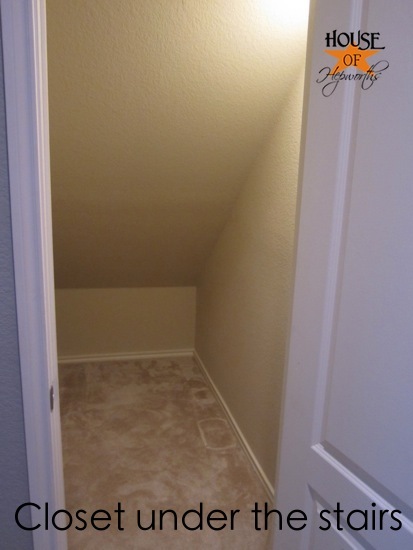 I know I’m in Texas and all, but I still can’t figure out why the builder didn’t add a coat closet. I’m so glad to get the coats out of the laundry room and into their own designated space. 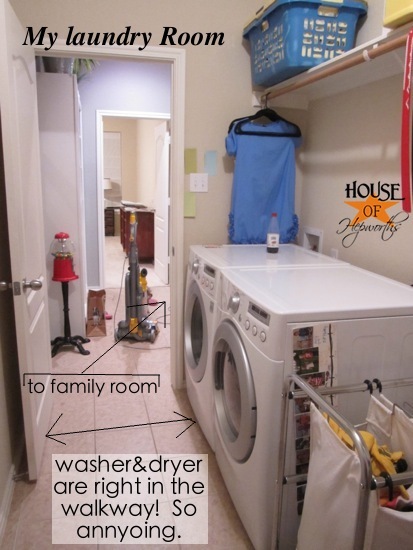 And I’m even more excited that the laundry room is going to have an official mud room space as well as tons of storage and an assigned space for all the laundry essentials. Can’t wait! I think it should be a law that a mom with kids has to approve all floor plans before a builder is allowed to build them! 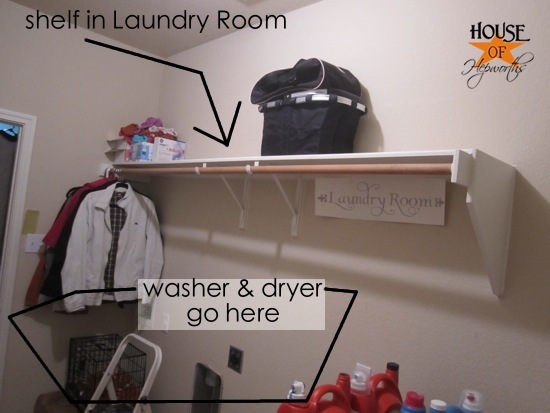 We would have huge laundry rooms and pantries and more designated spaces for coats and shoes! That is super…seriously! I’m so impressed! You are a genius! But you know that already right? You are so awesome! I love it! Amen with the law thing…and it looks great! 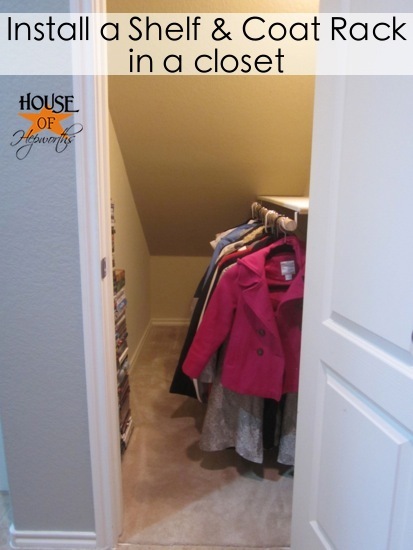 what a wasted space that was, I cannot imagine not having a closet for coats, but we are in canada so we have closets by our front doors, in most homes. I have mine filled and we rotate the coats depending on the season, so it doesn’t get over filled. Love, love LOVE this idea. 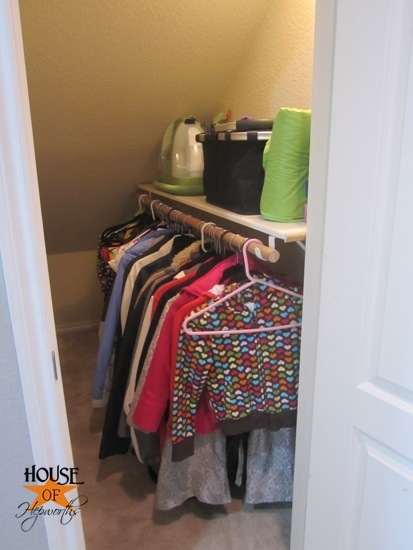 We have no coat closets in this house but we have a huge built-in storage cabinent in the bathroom that includes a “broom closet”. Not long after we moved in, I had a light bulb moment and we put a coat rod in it. It make only be 18 inches wide, but at least we can hang some coats!! What a great idea! It makes the space so much more functional! Love it! Love it. 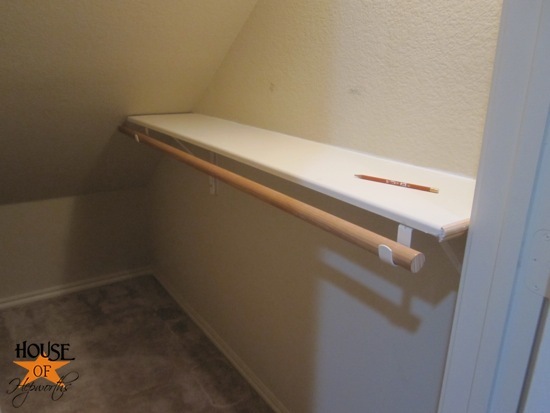 We had closets that like in the bedrooms of our first house, and in the master we did put the rod to the side. What a great use of space. Great idea. Love what you have done. What a brilliant switcheroo! 🙂 Not to mention that you got it done so quickly. Looks great! 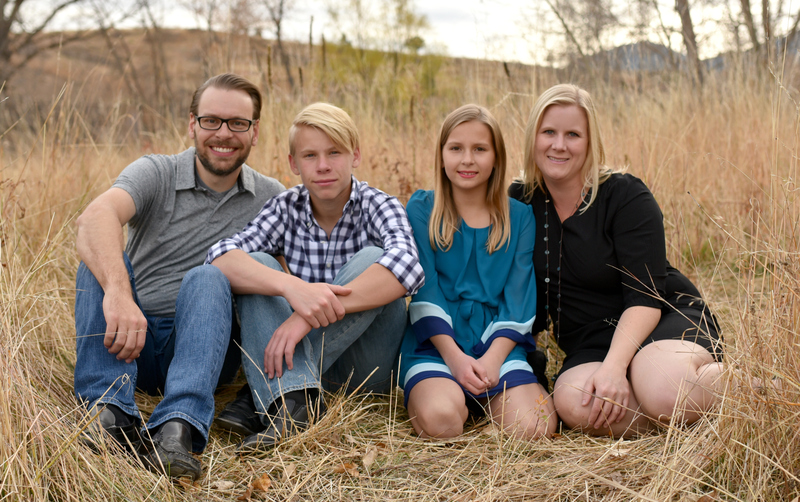 What an awesome job and so fun to see your little guy helping. SO glad I found this. Our master bedroom is on the second floor of our Cape style house, and our 2 closets are identical to this one (one of each side of the dormer). 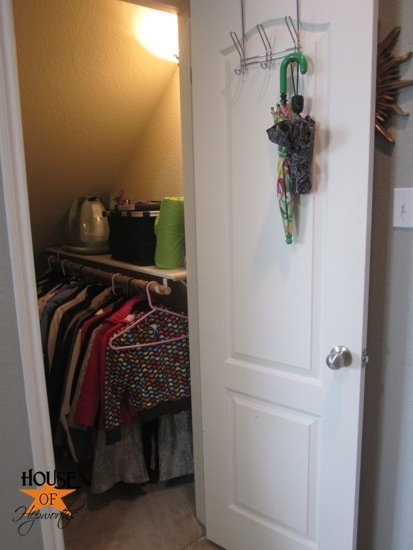 The previous owners left their tension rods up in the closets, so when you open the door their are just 2 rows of clothes hanging, one behind the other. It does fit PLENTY of clothes, but the whole back of the closet is wasted. 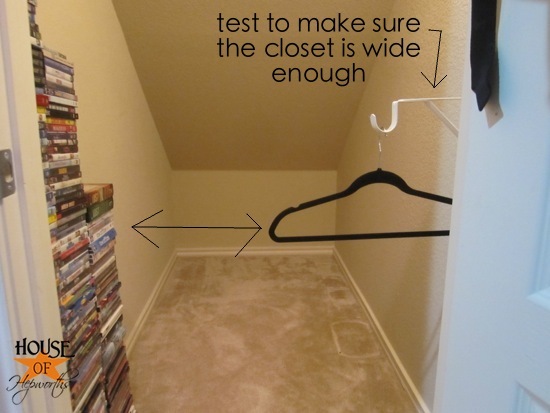 How wide is this closet? 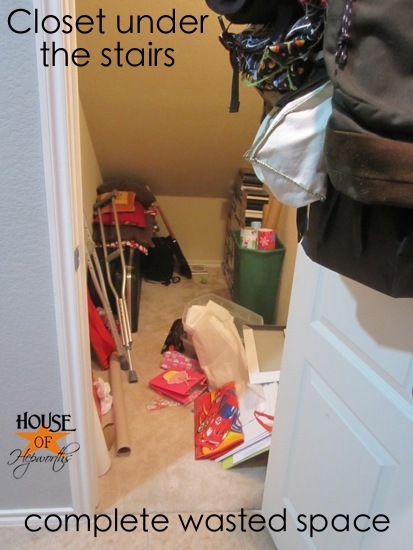 I’ve been googling coat closet under the stairs and the first two I’ve looked at (including yours) have crutches in the closet. I just thought that was funny. Mine are in the basement! You’ve done your job as I’m thinking outside the box of what’s currently in my useless closet that is always messy. Thanks!